Its rare when an Oscar winner for best picture gets remade into a feature-length film again. By my decidedly unscientific calculations — and not including TV versions — its happened just four times: 1931s Cimarron (remade in 1961); 1935s Mutiny on the Bounty (1962 and 1984); 1948s Hamlet (numerous); and now 1956s Around the World in 80 Days, which has been transformed into a Jackie Chan/Walt Disney family picture. In some ways, its not a bad choice. The original Oscar winner is something of a bore, more travelogue than drama, so a remake could enliven the story. On the other hand, the idea of a rich Englishman with a minority servant is a bit problematic today. 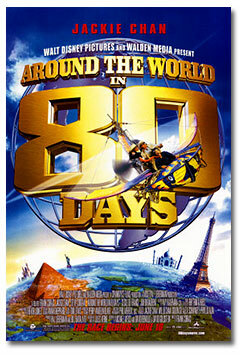 The new 80 Days handles any embarrassment this might cause by making Phileas Fogg (Steve Coogan) less stiff-lipped, time-keeping Brit than hapless inventor in need of a hug, while his valet, Passepartout (Jackie Chan), is, well, Jackie Chan, the star of the picture, who plays a man with his own agenda. Both films begin with bank robberies, but this time the culprit is actually Passepartout, who steals a jade Buddha that was originally stolen from his village in China. He takes the valet job as a cover, and suggests the trip around the world — which comes off not as a gentlemans wager, but as a schoolyard taunting between Fogg and the evil Lord Kelvin (Jim Broadbent) — in order to make it back to China. The 1956 version had numerous star cameos (Marlene Dietrich, Frank Sinatra), and the new film continues this tradition: Luke and Owen Wilson as Orville and Wilbur Wright; Sammo Hung as Chinese legend Wong Fei Hung. But the oddest cameo has to belong to gubenator Arnold Schwarzenegger as a Turkish prince, who, sporting a frizzy, dark Prince Valiant wig, attempts to make off with Foggs love interest, Monique La Roche (Cécil de France). The 80 days go by fast, light and sloppy. Director Frank Coraci (The Wedding Singer) crams it all in and drives the film forward, but loses the sense — which the original had — of what a big place the world used to be. The kids wont mind, though — its properly silly and slapsticky — while there are belly-laughs for the adults. Coogan, a star in Britain, and rising here, is hilarious as Fogg. Unfortunately, de France is miscast. Her edges are just too sharp for such a soft comedy. As for Jackie Chan? At 50, bless him, he can still move like a slippery bar of soap. Theres a great fight scene in his village in which he picks up a small wooden bench to defend himself. For those who know his early films, this is like Fred Astaire picking up a top hat and cane. You know the guy with the sword has no chance. This review originally appeared in The Seattle Times on June 16, 2004.